For my first book of 2018, I have to say I'm incredibly conflicted by Little Fires Everywhere. It's one of those novels that challenged me at every page turn. 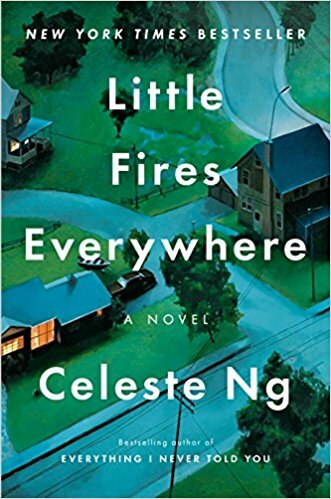 Little Fires Everywhere is a story about a neighborhood outside Cleveland that reminds me so much of a place I've lived for the last decade. It's perfectly manicured, expertly planned, and developed with an idea that you can create a perfect community. And whether you believe that this community is real, there's no doubt that there are always little fires everywhere. The story focuses on Mia and Pearl, a mother/daughter vagabond duo. They move around the country, not staying in one place for too long. They land in this beautiful community and their impact is immediate. The story revolves around their interactions with a couple of families in town and how those interactions confound and multiply. Think of the butterfly effect, but in a planned community. The story is told from a few characters perspective and jumps in time quite often. At times I found it a little hard to follow. What I adored about Little Fires Everywhere was that it subverted my expectations more times then I can count. It's a story that although small in scale is incredibly impactful. It's a story that challenges what you think you know about people, their lives, their families, and their hopes and dreams. We learn from Mia and Pearl more about the town and what mothers will do for their children. I'm being vague because I think the ramp up in the story is one of its greatest strengths. Sadly where the book ends was my only major gripe for Little Fires Everywhere. It ends in a place that didn't feel at all satisfying. No character has a resolution or even a semblance of one. And yet the journey far exceeded the destination and for that, I loved this book. It's something that will stick with me for a long, long time.